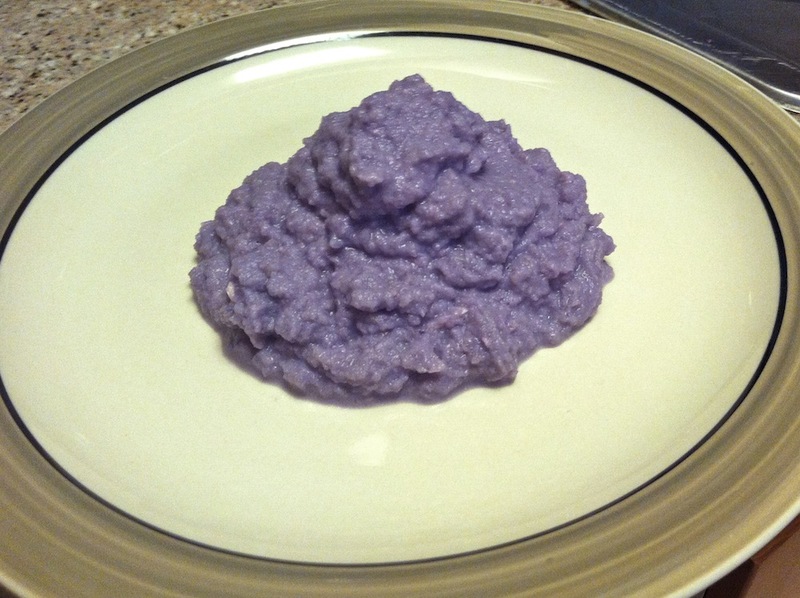 Purple Cauliflower Mash | Keep It Up, David! 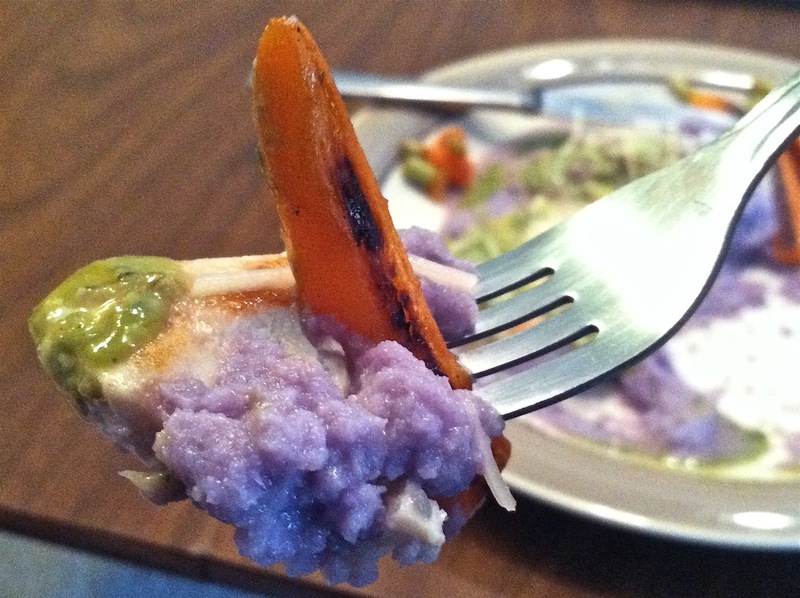 Since I left the orange cauliflower whole, I decided to do the exact opposite with this one, and make a healthy cauliflower mash. Diligent readers may have noticed that I already have a Cauliflower Mash recipe on my Recipes page, and, well, now there are two. They’re definitely different! I cut the cauliflower into florets, trying my best to keep them all roughly the same size, so they’d cook evenly. They all went into a steamer on my stove. 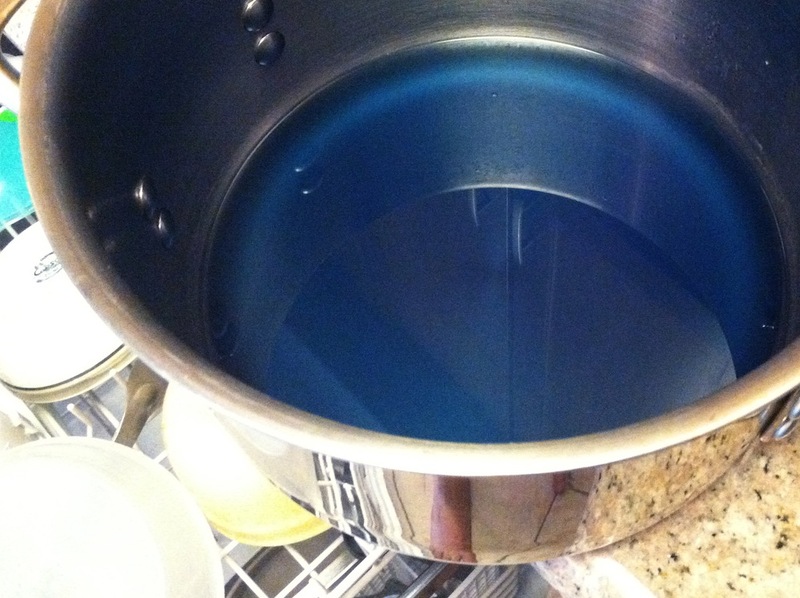 It took about 15-20 minutes to steam the entire head of florets, which barely all fit. About halfway through, I tossed in 6 cloves of garlic and a clove-sized chunk of fresh ginger, so they could steam a little, too. 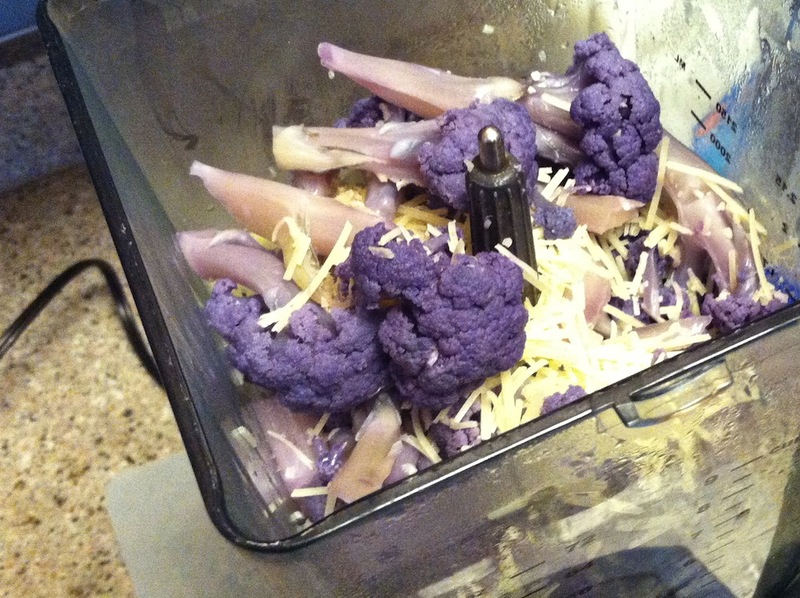 When the cauliflower was tender all the way through, I transferred it all into my Ninja blender. I made sure to put the garlic and cloves down at the bottom, so there was no chance they’d miss getting pulverized by the blades. 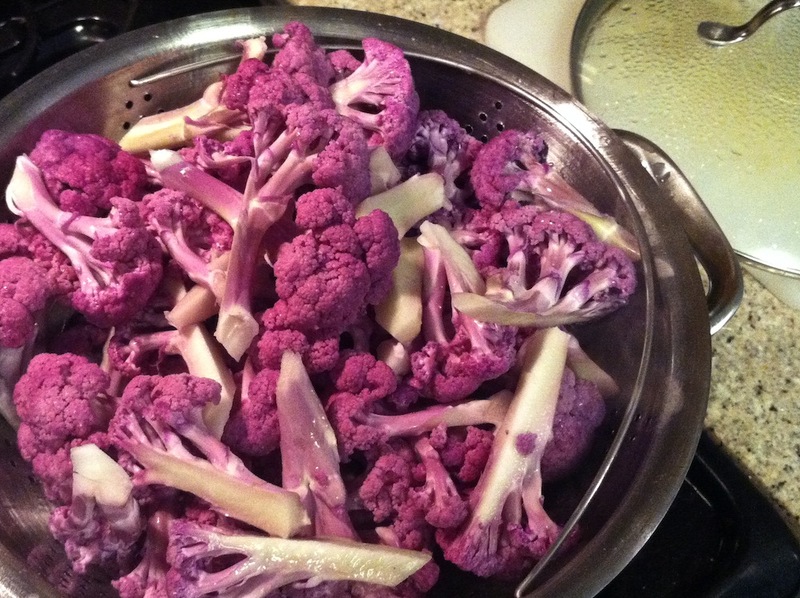 Cooking the cauliflower turned it an even deeper shade of purple! 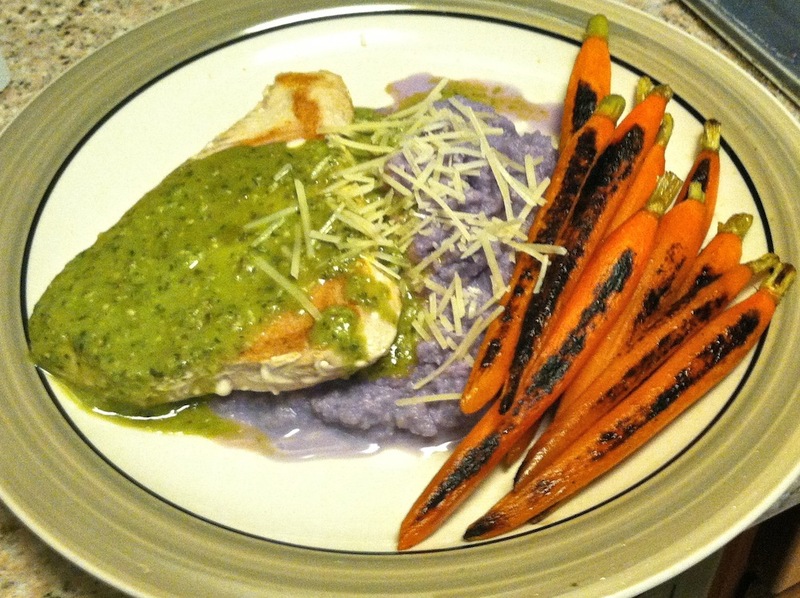 That’s a seared albacore tuna steak on the left, with a little Trader Joe’s Low-Fat Cilantro Salad Dressing as a sauce, and baby carrots, seared in a hot skillet with Pam, on the right. A pinch more Parmesan as a garnish. And it was delicious. The mash was infused with the garlic and ginger, which were great additions. I gobbled this plate up like it was my last meal. I love these little baby carrots, which the LA Salad Company sells peeled and with a little bit of the greens still there. 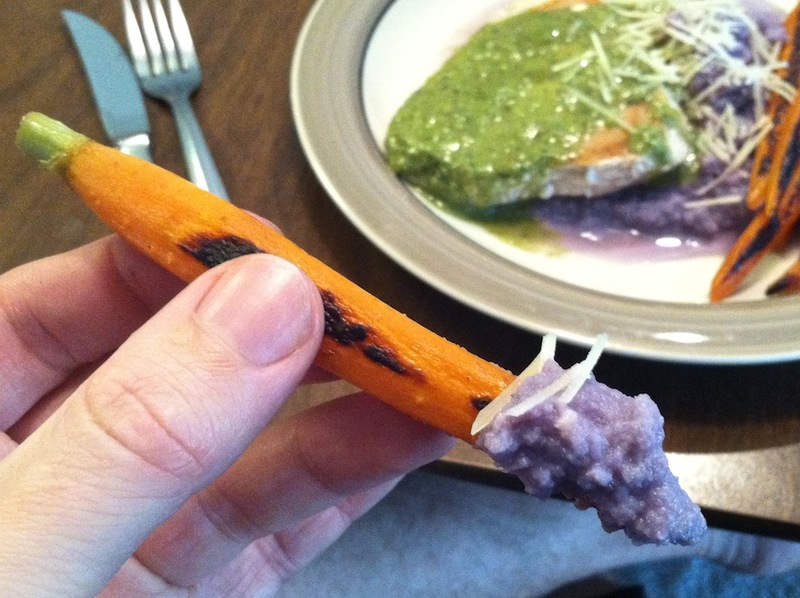 I’ve never had carrots like these in my home before – I’ve only had them at weddings and at fancy restaurants! What an fantastic lunch! Creamy, crunchy, tender and flavorful, all in the same bite. Dessert was a sumo tangerine. These guys are amazing – easy to peel, juicy, and big. They’re also rare and expensive – about $3 apiece – so I only bought one, as a treat. 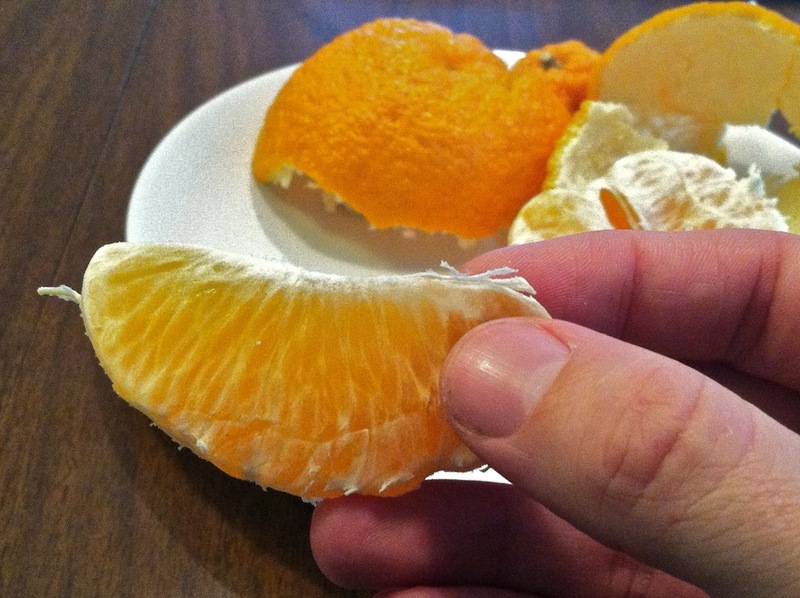 Sumo tangerines have a fascinating history that, oddly enough, is full of mystery and intrigue. I blogged about them a few years ago – check out that post here. There was one more surprise waiting for me when I did the dishes: The cauliflower had turned the steaming water bright blue! This post brings the Keep It Up, David Vegetable Week to a close. What vegetables will I enjoy next? What vegetables have you enjoying lately? This entry was posted on Thursday, March 27th, 2014 at 12:01 am and is filed under Uncategorized. You can follow any responses to this entry through the RSS 2.0 feed. You can leave a response, or trackback from your own site. You could drink that blue water. Didn’t even think about that, but you’re right! Would I have gained superpowers? David, I think we live in the same general area. 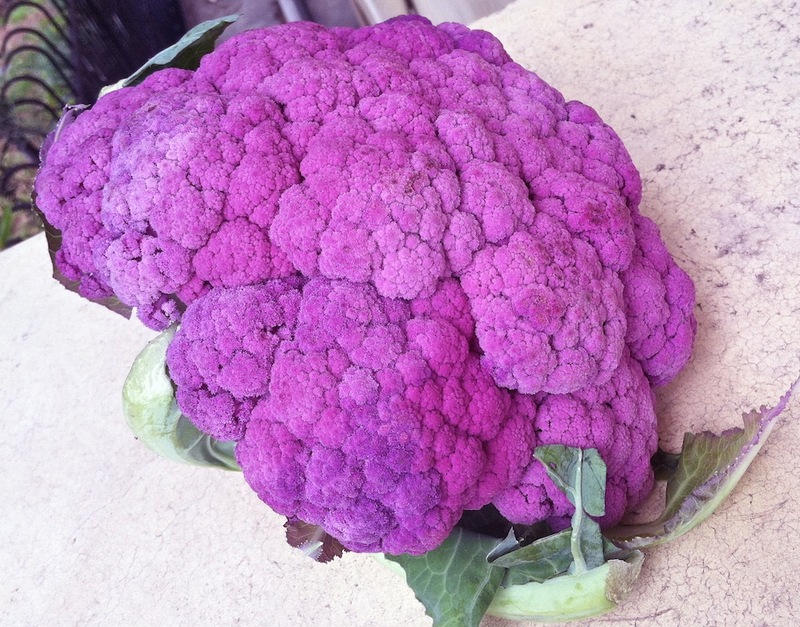 Where in the world did you find that purple cauliflower. Whole Foods? It’s gorgeous. Almost too pretty to eat. 🙂 And I think you could dye some Easter eggs in that water! Or tie-dye a shirt. LOL! I found it at Sprouts – the orange one, too. I’ve seen them at Whole Foods in years past, but I haven’t been to Whole Foods in a while, so don’t know if they have them this year or not!